November 8, 2016, 4:53 PM · Congratulations to American cellist Julian Schwarz and Canadian pianist Marika Bournaki, who won First Prize last week at Boulder International Chamber Music Competition’s 'Art of the Duo'. Pianist Marika Bournaki and cellist Julian Schwarz. * also won Special Prize ($500) for the Best Performance of the required piece, "Some Assembly Required," by Arthur Gottschalk. The competition, held annually in Boulder, Colo., received 156 applications from 25 countries this year, with 22 duos selected to participate in the competition. Jury members included Martin Beaver, Elisabeth Pridonoff and Richie Hawley. Schwarz made his solo debut at age 11, performing Saint-Saëns Concerto No. 1 with Seattle Symphony, with his father, Gerard Schwarz conducting. He also won first prize in the professional cello division of the 2013 Alice and Eleonore Schoenfeld International String Competition in Hong Kong. 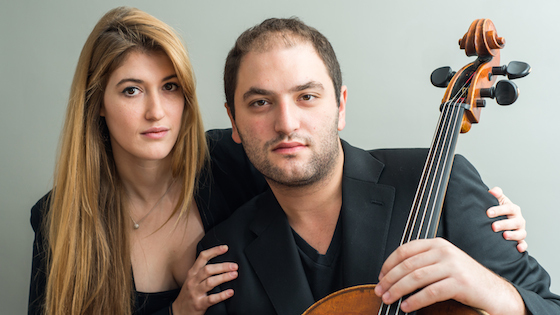 Both Schwarz and Bournaki are graduates of the Juilliard School and on faculty at Eastern Music Festival and the Lunenburg Academy of Music Performance. Together they have recorded the complete works for cello and piano by Ernest Bloch for the Milken Archive of American Jewish Music. BELOW: Cellist Julian Schwarz and pianist Marika Bournaki play "Meditation Hebraique" by Ernest Bloch. November 9, 2016 at 07:01 PM · I was at the competition. This Bloch had me in tears, no, in sobs. November 10, 2016 at 02:46 PM · That Bloch is very nice -- cello daughter (10 yo) enjoyed it.